Air Products and Chemicals, Inc. APD has been awarded contract to supply additional gaseous nitrogen and hydrogen to Samsung Electronics’ semiconductor fab in Giheung, South Korea. Air Products has been supplying industrial gases to Samsung Electronics' Giheung site since 1998. To meet the rising demand, the company will invest in building a new air separation unit, pipelines and multiple hydrogen plants, which are scheduled to come onstream from 2020. The investment reflects Air Product’s commitment to serve strategic customers as well as the broader semiconductor and electronics industries with company’s safety, efficiency, reliability and excellent service. Air Products’ shares have moved up 11.3% in a year, outperforming the industry’s 2.1% rise. Air Products, in July, raised its adjusted earnings guidance for fiscal 2018. It now anticipates adjusted earnings per share in the range of $7.40 to $7.45 (a 17-18% increase from the prior year), compared with the earlier view of $7.25 to $7.40. The company expects adjusted earnings in the band of $1.95 to $2.00 for the fiscal fourth quarter, up 11-14% year over year. Revenues from the company’s Industrial Gases – America segment increased year over year in the fiscal-third quarter supported by strong hydrogen demand and favorable merchant gases volumes. Sales from Industrial Gases – Europe, Middle East, and Africa (EMEA) and Industrial Gases – Asia segments climbed year over year on the back of higher volumes and pricing as well as favorable currency swings. Air Products remains focused on growing its core industrial gases business. Moreover, the company’s strong balance sheet and cash flows will allow it to make strong investments in the next few years. The company has a capacity to deploy at least $15 billion in high-return investments over the next five years, which will boost shareholders’ value. 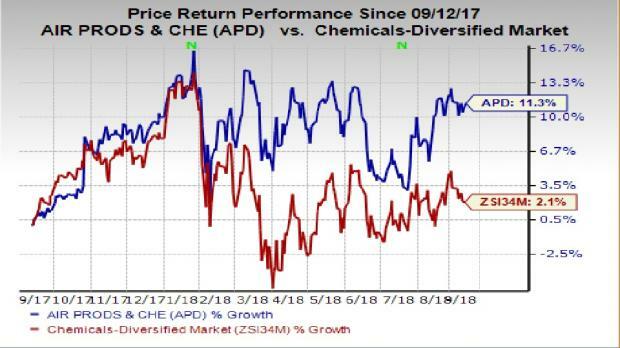 Air Products currently carries a Zacks Rank #2 (Buy). A few other top-ranked stocks in the basic materials space are Huntsman Corporation HUN, Ingevity Corporation NGVT and Celanese Corporation CE, each sporting a Zacks Rank #1 (Strong Buy). You can see the complete list of today’s Zacks #1 Rank stocks here. Huntsman has an expected long-term earnings growth rate of 8.5%. Its shares have returned 4.2% in a year. Ingevity has an expected long-term earnings growth rate of 12%. Its shares have surged 64.4% in the past year. Celanese has an expected long-term earnings growth rate of 10%. Its shares have gained 15.4% in the past year.